Over the last five blog posts in this series, we’ve talked about where bottled water comes from, the family owned vs corporate bottlers, the trend of imported water, and the responsibilities of water bottlers to the earth and to its customers. As a small bottled water company, we are building a niche in the market that didn’t exist prior to our company. We don’t say that to make ourselves sound important, we say it to get our point across that we want to change the way water is bottled and sold. To wrap up this series, and before we start our next one, we want to spend a little time talking about our place in the world. 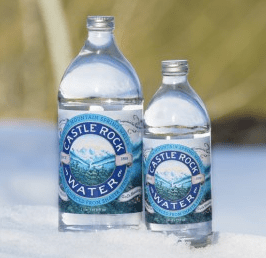 Why does Castle Rock Water exist and what are the goals of the company? Castle Rock Water was started by Thomas Greither, a nutritionist whom has a long history in the health field. Greither is passionate about the quality of the water we drink and believes the spring water in Dunsmuir, Calif., which originates from the glaciers atop Mount Shasta and is naturally filtered through miles of rock and stone, is the best water on the planet (judges from the Berkeley Springs International Water Tasting Competition agree). From his nutritionist’s perspective, water is highly undervalued and the best quality water comes from right here in America. It’s a substance we don’t pay any attention to. We just say, ‘It’s good enough,’ But the human body, up to 90 percent of it is water. Water is the most important ingredient. High-quality water makes a difference. I want to educate people that water is not just water; we should pay attention to what type of water we use, especially for our health. In addition to offering the planet’s best water, Griether wanted his company to operate ethically and responsibly. In 2014 Castle Rock Water was certified by the Institute for Marketecology in Switzerland as socially responsible. I wanted to start a water company that has a fair relationship with the community. I feel in my heart that natural resources should belong to the people. The springs are owned by the city of Dunsmuir and the company pays for the water it bottles while also giving a portion of sales back to the local community. It also donates to charities that work to bring clean drinking water to everyone. In our next series, we’ll look into the quality of tap water around the United States. It seems every day there’s a new story about a city’s water being dangerously contaminated. Why is this happening and how can we protect ourselves?